setting up my template than posting. me will have accessed the blog (but I just started it today -- Aug. 12). Welcome to the blogoshpere and the B-Team, Chris! I just realized I was a complete idiot when I wrote my email. The link above where take you where you want to go ... if you want to go, but it's better as http://regina-caeli.blogspot.com. The www isn't necessary. 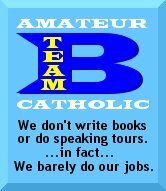 Welcome to the world of fumbling blogging catholics. We not only "barely do our jobs", we barely wing html for the glory of Almighty God!